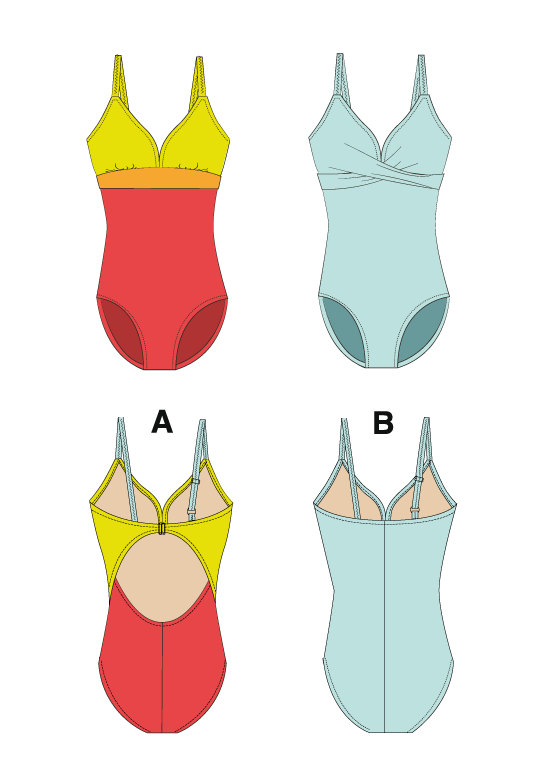 We will show you in detail how to make a 3350 one-piece swimsuit. The pattern is available in both paper and PDF formats. Extra variation: We will show you how to alter the lower front pattern piece for a gathered front. You will need a good quality lycra with nice stretch and recovery both in the length and in the width. When shopping for your swimwear fabrics, look for nylon/spandex or nylon/lycra. If you plan on making a tummy-control version (full back, powernet lining), you want to avoid the beautiful poly/spandex prints for the bottom part of your swimsuit as they are thinner / have less body and don't look as beautiful when stretched out. You can find swimwear lining at all three stores listed above. We often see beige lining, but we prefer going with black or white, whatever compliments the fabric best. For a tummy-control swimsuit, you can use PowerNet (a mesh with limited stretch) for the lower front. You will still need regular lining for the bust. Please refer to the back of the pattern for yardage. If you would like to gathers at lower front, please add 1/3 yard (30 cm) to the lower front fabric yardage. With the sweetheart, you can use one, two or three different fabrics. Your fabric choice will help you enhance your body's best assets. It looks great in solids, stripes, florals... You can also use the straps if you want to add a little pop of color too. To enhance, use a lighter or bright color or go with an eye-catching print. To minimize, go with a darker color for the bottom piece or more subtle print. To emphasize curves, pick a print that creates a cut-out or princess seam effect. The twist front looks best in a solid or print that will make the twist detail stand out. With some florals, the twist becomes less visible. You can use the same fabric all over, or go with contrast twist front or straps. There is no contrast band on this one. Knit elastic: That is what we have always used on swimsuits because it is very easy to sew and has great stretch and recovery without being too stiff. It always had a great lifespan too. It is also easy to find in most fabric stores. Do not use braided or woven elastic. We explain why in our How to Sew Elastics video. Rubber: Our favorite is by far FILPAR rubber elastic. If you plan to spend more time in the sun than in the water, you can use bra strapping for your swimsuit straps. They will save you some time and will look just as good (but do not resist as well to chlorine or salt water)! Sew Sassy sells strap kits that includes the straps, rings and sliders. If you cannot find one, don't worry. You can still make the open-back style, but the top section will simply sewn at center back. 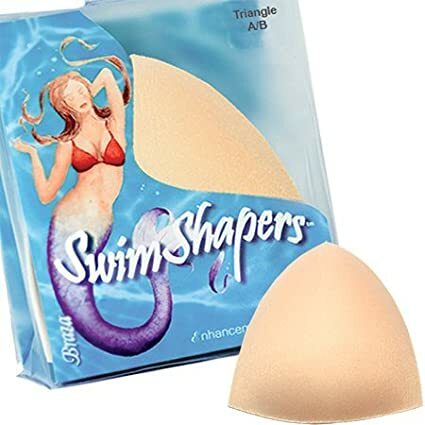 These triangle padded cups are also great for AA/A/small B women who want a nice shape. We have been using Schmetz Stretch needles on all our projects since 1983, on both our regular machine and serger. I think that will be enough for today :) Gather your fabric, order your pattern through our website or your favorite Jalie retailer and free up some time in your schedule next week for your fabulous swimsuit project! The next post about sizing and pattern alteration. If you have any questions about the design, fabric or notions, please write them in the comments.